It was a very hot day today - thankfully broken up with a bit of cloud and a gentle breeze. 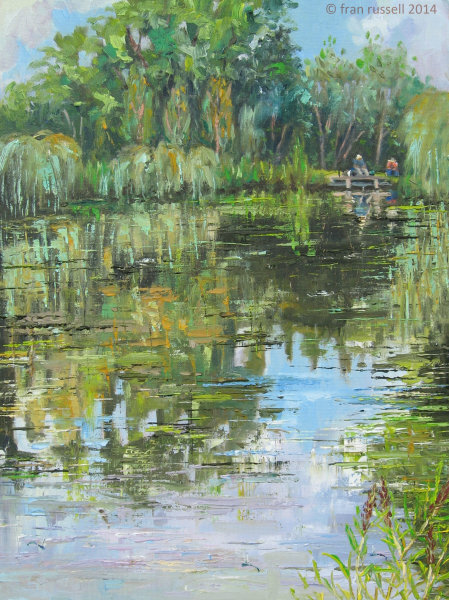 I made a return visit to Hartley Lands Fishery to complete a painting I started about 10 days ago and managed to complete a 2nd. The carp in this fishing lake are so beautiful and very sociable - popping up every now and then and blowing air bubbles at me. I had a really lovely day there, as always. 40 x 30 cm. Oil on board.